All dogs need playtime and one of their favorite pastimes is playing fetch with their human masters. Playing fetch with your favorite pet provides a host of benefits to your beloved hound. Not only does it promote greater health through exercise, it also helps strengthen that bond that you have with your pet. But there are instances when you really cannot play with your dog because of other commitments. Your dog’s playtime need not suffer because of these important activities of yours. 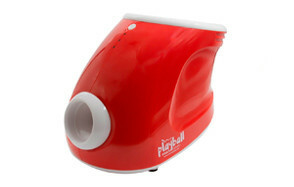 You can get for them one of these best automatic fetch machines that we have researched just for you. 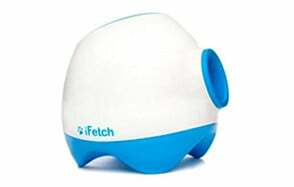 The iFetch Interactive Ball Launcher for Dogs is designed specifically for smaller breeds of dogs because of its utilization of smaller-sized tennis balls measuring just 1.6 inches in diameter. This should always be factored in your buying decision as these mini tennis balls can be choking hazards for larger breeds. 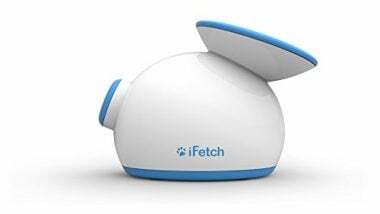 The iFetch is a great tool to keep your dog fully entertained with its favorite game of fetch whether you have something else to do or you simply want to watch your pet have fun. 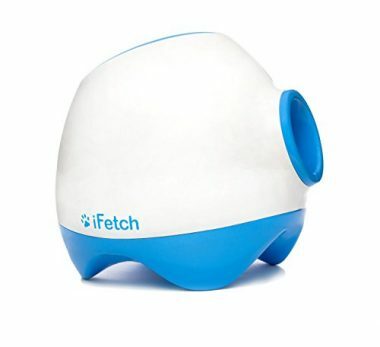 There’s an issue with the durability of the iFetch’s power unit, though, with some pet parents saying it dies out after several months of use. At least, you get to use its 12-month worry-free warranty. 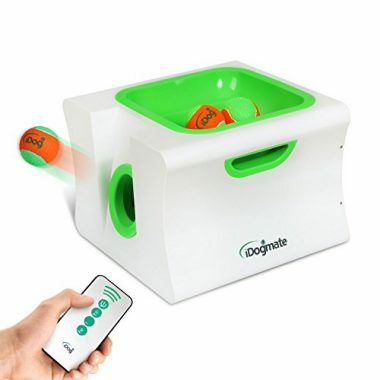 If you’re looking for a safer device that automatically launches balls for your pet hound, then PetSafe’s Automatic Ball Launcher Tennis Ball Throwing Machine for Dogs is always a good choice. While there are issues about the unusually loud ‘bang’ of its launcher, its advanced safety features are what makes the PetSafe quite appealing. Its motion sensors prevent balls from getting launched if there are objects up to 7 feet in front of the device. It has sensors in the chambers, too so it won’t activate the launcher without any ball to toss. Speaking of tossing balls, there are 9 distance settings and 6 angles of toss so you can really keep your hound super-busy both in and outside your home. 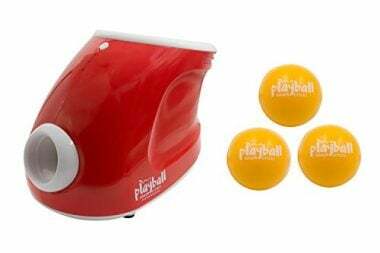 For pet parents of smaller dog breeds, the Couch Potato Playball Automatic Ball Launcher & Thrower is a good alternative since it uses 1.5-inch saliva-resistant balls. It has an adorable design and simple styling, too, making it a great addition to your growing number of dog accessories in the home. It doesn’t toss balls that far, though, with the farthest being 20 feet. Still, it should provide endless fun for your small hound. It’s the ideal solution for pet parents who don’t want to spend more than a hundred dollars on such a gadget, too. One of the best things about the iDogmate Ball Launcher is that it comes as a boxy device which helps provide greater stability against getting toppled by rambunctious dogs. The remote control mechanism plus the 4-level throwing distance adjustments are also a welcome change. Fully capable of throwing balls up to 50 feet, although there have been pet parents who complain the iDogmate fails in its published throwing distances, this device should be ideal for dogs that love fetching balls thrown farther distances. It can use a variety of 2.5-inch balls, too, from your tennis balls to rope balls and even durafoam balls. Just be ready to shell out a couple hundred dollars, though. But if you look at what you’re getting, it’s definitely a steal. iFetch Too is actually the bigger brother of the iFetch Interactive Ball Launcher. 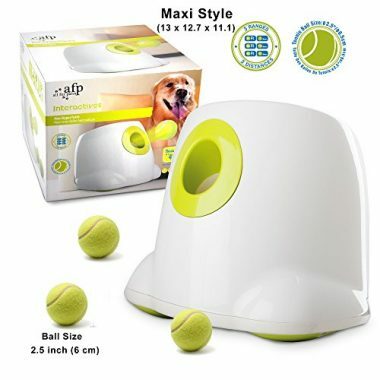 Because of its larger size it can accommodate standard-sized tennis balls as well as toss the ball up to 40 feet whereas the little iFetch can only manage 30 feet tops. 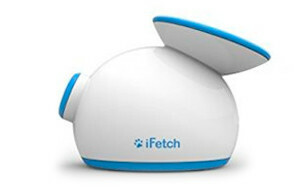 It doesn’t rely on alkaline batteries, too since the iFetch Too already comes with rechargeable lithium-ion batteries. The problem is that the auto-shutoff feature has a very short window, only 60 seconds. This prevents dogs from really having fun with their ball launcher since the device already turns itself off by the time dogs have a chance to put the ball back into the hopper. The Hyperfecth Ultimate Throwing Interactive Ball Launcher for Dogs is a neat-looking automatic fetch machine that comes with 3 selectable settings for throwing distances. Requiring only about 170 square inches of surface area, the Hyperfetch is a great option for those who may have several tubes of worn-out tennis balls in their closet. It comes with an automatic scanner which makes sure that the chamber has a ball before activating its throwing mechanism. The downside is that there have been issues on the Hyperfetch’s reliability especially in terms of its battery and throwing capabilities. Why Do Dogs Love Playing Fetch? It is a well-known fact that dogs love to play fetch. But why are our four-legged friends so obsessed with this game? Experts agree that this instinct to chase and fetch is already within the very nature of dogs even before they were first domesticated. There are several explanations offered by leading animal behaviorists as to why dogs behave as such. First, it is ingrained in their predatory instincts. In the wild, anything that moves is considered prey. Anything that can stimulate their other senses, such as hearing and smell, can also be interpreted as the presence of prey. As such, whenever dogs hear or smell something, they automatically orient their heads in the direction of the potential source of this stimulus. When the finally ‘see’ it, they’d instantly run after it. Second, dogs generally feel good about themselves whenever they do these things. It is a self-reinforcing behavior. They don’t necessarily need a pat on the back, a reward, or even a treat for being able to run after the ‘prey’ and bring it back to their human masters. They just enjoy doing it. Third, every time they receive attention from their human friend, they also feel good. 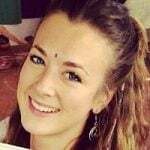 This reinforces the natural instinct to chase and to bring back that item to man. It should be remembered that dogs are highly social animals and that they thrive on positive reinforcements. These are handed down through generations, with each generation passing invaluable tips and tricks of the trade that make the succeeding generations more adept at fetching. And this is the reason why dogs simply love a game of fetch. What Makes a Good Automatic Fetch Machine? The traditional way of playing fetch involves throwing a ball, a stick, or any other object for your dog to chase, put it into its mouth, and ‘mouth’ it over to you. Of course, there will always be instances when you simply don’t have the time to play with your dog. This is where an automatic ball thrower and an automatic fetching machine can be really handy. But what makes a good automatic fetch machine anyway? Let’s look at the features of a really good machine. You want a gadget that your dog can easily be trained to use or operate by itself. The reason why you’re getting a device such as this is that you really don’t have the time to play fetch with your pet. If the device will require you to put balls into it every time, then it will be better to just play with your dog. Automatic fetch machines should have ports that are low and wide enough for your pet to drop the ball with its mouth. Once the ball is in, the machine will wait several seconds before launching it into the air and your dog will be running after it again. This is how automatic fetch machines should work. It allows for independent playtime for your dog. You’ve got to train your dog, of course. Most fetch machines come with highly variable throwing distances with some reaching up to 50 feet, although most will max out at 30 feet. It is important to choose a device that allows for fully adjustable throwing distances so you can choose the correct settings depending on your surroundings. For instance, if you’re indoors, you don’t expect the machine to toss balls up to 30 feet unless you’ve got a mansion to begin with. Canine playtime should not be restricted only to the outdoors. If it is raining or snowing outside, then your dog will be gloomy, bored, and sad for not being able to play. That’s why it is best to look for a machine that can be used both indoors and outdoors so your dog can entertain itself in various settings. There are machines that only accept a certain type and size of a ball. You will have a much better option if you go for machines that accept a variety of balls from mini balls to tennis balls and even foam and rope balls. Based on the features of the automatic fetch machine, you will need to check if the price tag is well worth it. The problem with some products is that the features and the overall design and construction do not do justice to the price tag. It is one thing to buy a really good ball fetch machine and an entirely different matter to train your dog on how to use it properly, safely, and independently. As we have already mentioned above, an automatic fetch machine should foster independent play for dogs. But before they can do this, you’d have to train them. Here’s how. Get ready with your automatic fetch machine. Be ready with your clicker and plenty of treats, too. Acclimatize your dog to the presence of the machine. Don’t operate the machine yet. Just leave it standing on the floor or even in your backyard for your pet to ‘inspect’ it. If it does click and give your pet its favorite treat. Don’t forget lavish praises. The thing you want here is for your pet to associate the machine to positive and pleasant experiences. 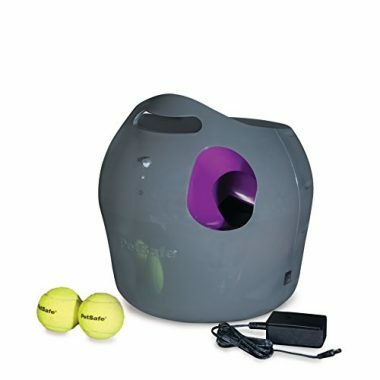 Once your pet is comfortable with the machine, you can start training your pet to become more familiar with the noise of the ball fetch gadget. Place the machine in such a way that it is some considerable distance from your dog. The ideal distance should be that the noise created by the machine will be audible for your dog, but not startle it in such a way that it will scare your hound. Now turn the machine on and get ready. Once it beeps or emits a warning tone, clicks, and immediately give your dog its treat. At the same time, say ‘yes!’ or some other trigger word. Repeat this several times until your pet is comfortable with the noise or the sound from the device. The next step is for you to train your dog in retrieving the ball and bringing it to you while the machine is running. Start with the machine fully running and command your dog to come near the machine. If it does, click. Now load the ball and allow it to be tossed by the machine. Let your pet retrieve the ball. Your dog should be able to bring the ball back to you. When it does, click and present the treat. This will make your pet to drop the ball to take the treat. As soon as your dog releases the ball, give the command ‘drop it’. Do this several times until your pet has mastered the skill of bringing and dropping the ball on cue. The last phase of the training is having your hand just above the port where the ball can be dropped into the machine. Present your open hand with the treat so your dog knows that the treat is there. Your dog should be able to drop the ball directly into the launcher’s bucket as it attempts to take the treat from your hand. Give the command ‘drop it’ as soon as it drops the ball. Click and give the treat. You need to go slow with each step of the process. Over time, you will no longer need the clicker and the treat as your dog already has associated fetching the ball with many positive things. Fetching a ball may seem like a very tedious game for dogs. However, this actually provides a host of benefits especially if you’re using an automatic fetch machine. Here are some of them. Training your pet how to use an automatic fetch machine not only helps it feel good about itself, but also helps improve its cognition especially problem-solving skills. These machines also help sharpen your dog’s alertness as they begin to learn that the visual and auditory cues emanating from the machine means a ball will be launching any time soon. This can also help prevent canine boredom. Instead of leading a sedentary lifestyle, dogs will be more than motivated to keep on playing something that they are inherently designed by nature to do. Running after a ball and dropping it into the launcher’s bucket requires strong muscles and stamina to run back and forth. You don’t even need a gym or a park anymore to get your pet in tiptop shape. Automatic fetch machines also help foster independent play. If you trained your dog properly it will no longer rely on you for a game of fetch as it can do this on its own. However, we still do recommend playing fetch with your dog from time to time because the human-dog interaction can never be replicated by a machine. Automatic fetch machines may be considered by some as a pet parent’s lame excuse for not tending to the playtime needs of his or her dog on a more personal basis. That is why, as handy as invaluable these gadgets are, we still strongly recommend spending time with your pet so that they can still benefit from the warmth of that human interaction they need. For those really busy times, then any of these best automatic fetch machines should come in handy.